Dolby Atmos is a surround sound technology from Dolby Laboratories. It debuted in 2012, and is designed to "pull you inside the action" with sound that moves around you in a three-dimensional space without being constrained to channels. Microsoft supports Dolby Access in Windows 10 Creators Update, and enabling it and using it is straightforward, but there are some catches to be aware of. 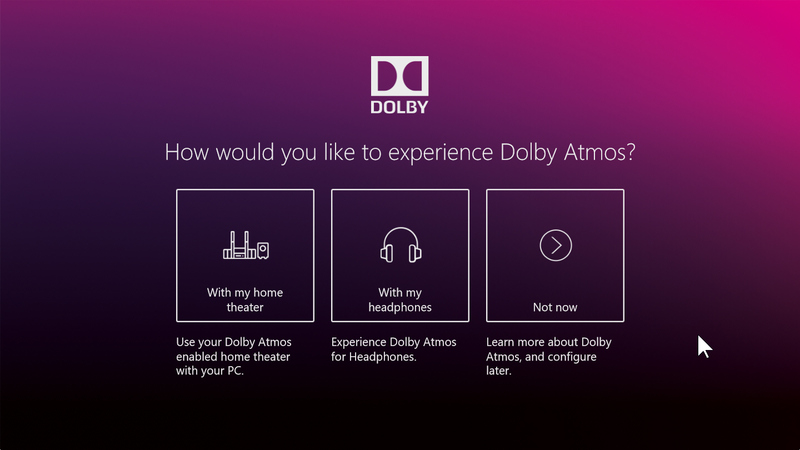 Firstly, if you want to experience Dolby Atmos for home theater you’ll need to have a PC that supports HDMI output, and a Dolby Atmos enabled home theater system, sound bar, or TV. You can also experience it via headphones -- any will work, although the higher the quality the better, and you’ll need to make sure there’s no built-in sound virtualization (surround sound), or if there is, that you turn it off (you’ll also need to turn off any existing built in sound virtualization on your PC). This will prevent the sound being processed twice. You will then need to download Dolby Access. This is a free app for Windows 10 (and Xbox) that lets you setup, configure and enjoy Atmos sound. While Access is free, and you can use it to experience Dolby Atmos on a home theater setup at no cost, Dolby Atmos for Headphones costs $15/£13.89. There is a 30-day trial, however, so you can see whether it’s worth paying for or not. To set it up, install and run and Access. Choose how you would like to experience Atmos. If have a connected home theater system select that option, otherwise choose 'With my headphones'. Since most people will opt for this, we’ll look at how to proceed from here. Access will display a list of potential headphone connections, and select the most likely one. You can pick a different option if it’s not right. You can also troubleshoot your connections here, or just click Continue to move on. You’ll now be given the option to start your 30-day free trial or buy Dolby Atmos for Headphones. Unless you know for certain it will perform perfectly, select the former. The app will download everything that’s required. When asked if you want to download content now, click OK.
Once that completes, click Configure PC Settings. 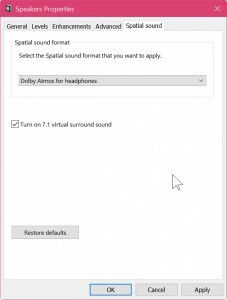 In the 'Spatial sound' tab in the Speakers Properties box, select 'Dolby Atmos for Headphones' and make sure 'Turn on 7.1 virtual surround sound' is checked. 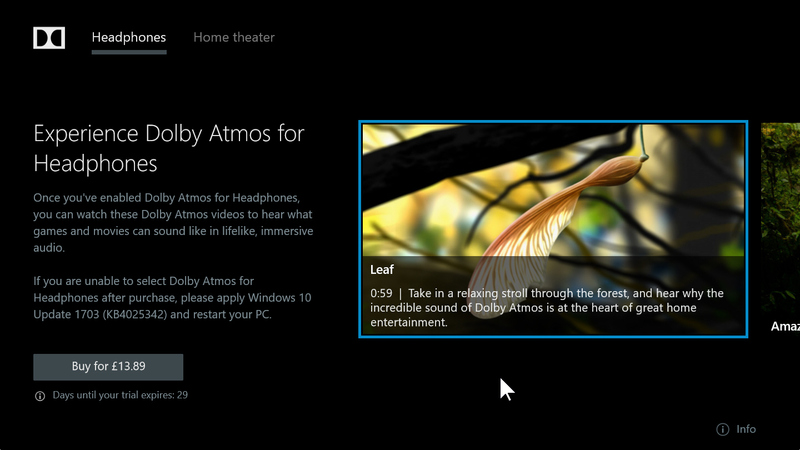 Back in Access, you should see a message telling you that Dolby Atmos for Headphones is ready. Click Continue. You’ll now be able to try it out for yourself by clicking on any of the Atmos videos in the app. There are five to choose from -- Leaf, Amaze, Red Bull Racing, Shattered, and Silent. Watch them while wearing your headphones, and you should experience the delights of Dolby Atmos. 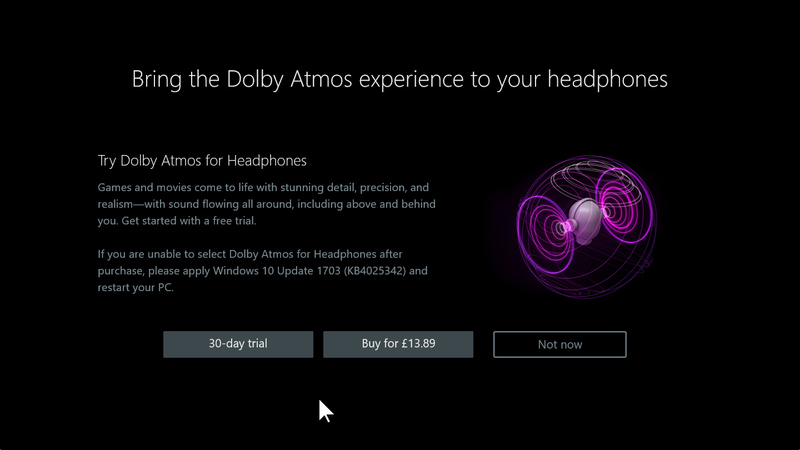 If you’re impressed, you can purchase the full version of Dolby Atmos for Headphones, or wait until your trial expires and make a decision then.